﻿Virginia's Top-Rated Irish Music Trio! More five star reviews in the past year than any other Irish trio in Virginia! Browse more than 50 recent five-star reviews here. 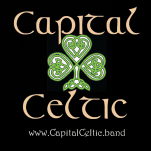 The ﻿Capital Celtic band brings the best music of Ireland to your private event or venue in Virginia. Affordable for nearly any budget! Our trio of a fiddler, flutist and acoustic guitar/mandolin player, with both male and female vocals provide a rich, varied sound that will keep your guests tapping their feet, dancing and singing along. 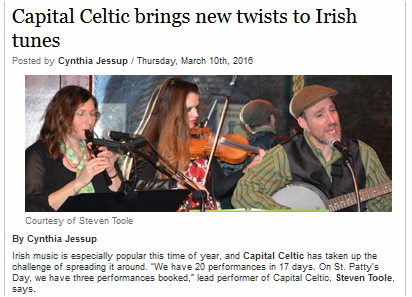 Inquire today for a free, same-day/no broker fee quote to have Capital Celtic perform live Celtic music at your wedding, St. Patrick's event, party, festival, winery or pub in Virginia.